Battle II has Penn's HT-100 Versa-Drag washers keyed into the spool which allows both sides of each drag washer to be used. This gives the Battle II higher max drags. Paired this up with the St. Croix TSRS90Mr Travel rod, can't wait to his the east cost beaches. This reel is excellent, I highly recommend this reel. This reel is a fine piece of work. I was hesitant at first because I've been using Penn 712 z's for ever, but one finally wore out so I ordered a Battle II 4000. It's the perfect replacement for the 712. I've got it on a 7' medium action Ugly Stick. Feels right, can't wait to get out on the water! Again this reel is well worth the money and I will be buying another soon. Hey, it's a Penn, gotta love it...George D.
ProsIt's a well made, smooth and solid reel. This is my second 5000 size reel. I one for vertical jigging and the second for pitching out mullets at the jetties. Affordable reel that will handle big fish. ProsHandle a 23 inch red grouper like a pro. Works great for Crab snaring on the West Coast. I own 3 of these reels to date and have had no problems. ProsPrice, quality and Penn parts are very available. I use this reel for finesse saltwater fishing where it is exposed to sea water and sand. All i can say is that it is bulletproof! The reel is smooth and the drag can handle big fish like Jacks and Macks. Like everything you get what you pay for, and this is no exception. If you take care of it you wont have any issues. Pen reels are great. They stand up to use day in and day out! Ok for the price of the reel but you HAVR TO MAINTAIN IT! Durable reel , but really need to focus on taking care of it or else it will go quick. Sturdy, smooth and saltwater rated! I use this reel for jigging tiny lures for snappers and groupers. The reel is built like a tank, is very smooth, have a decent drag and is very resistant to saltwater. I highly recommend this reel. Power Pro Spectra braid 300 yards of 40 lb test. I am going buy a Penn Battle 2 3000 for inshore fluke/flounder fishing. Can you recommend some rods that would be great paired with this reel? I will be using bucktails no heavier than 3 ounces. Hi, I'm looking at buying a Penn Fierce 3000 for my son and a Penn Battle II 4000 for myself - saltwater fishing from land and boat (not going for the big stuff) - local fishers recommend 15lb test mono - can I load these reels up with that line - it seems to exceed the recommended lines but I don't really want to go too big reel wise for my son (who is 9) - probably going to pair these reels up with Ugly Stik GX2 Medium 2 piece 6ft and 7ft rods so need reels which aren't too big/heavy. Any help would be appreciated, many thanks. If you wanted to use that pound test, I would switch to a bigger reel or use braided line instead. With 15lb monofilament you would not fit enough line on the reel. Another option would be to use a lighter mono. This reel is made in China, not USA. 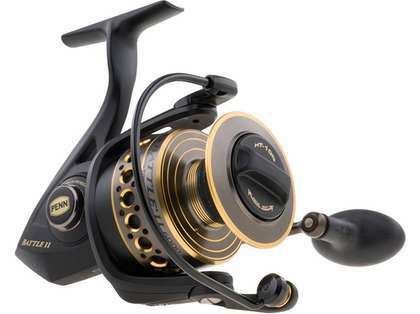 The only Penn spinning reels still made in the USA are the Z-Series and the Torque series. How do you load line on a spinning reel? You would tie your line onto the reel using an "arbor knot" if using mono line, if you are using braided line then you would tie it onto the reel using a "uni-knot" and then put a small piece of tape on top of the knot/line (electrical works best) in order to prevent your braided line to spin or move on the reel. Then, you would make sure the line lays under the bail correctly, shut the bail, and with your drag turned tight start reeling the line onto your reel. When reeling on the line, I like to have another person hold the spool of line I am using (with a screwdriver going through the hole/middle of the spool so that the spool can spin smoothly) so I can get the tightest handle on it, allowing my line to go on as tight as possible. The 6000/7000 size would probably be your best bet on an 11 foot rod. I have a 9 foot Penn Prevail surf rod with a Battle II 5000 and it balances perfectly. This reel would be great for that fishing application, the 3000 size would an excellent choice for those species of fish. Hi tackle direct! I am interested in battle 5000 for off shore jigging and want to make sure if its drag knob is waterproof type or not.Which type is it? Also I heard that its handle is compatible with conflict 5000's.Is it true? The Battle II reels are not waterproof. The Spin fisher is sealed, but not completely waterproof. It will work well for you with your application. If you want a waterproof reel, you are looking at a Van Staal or ZeeBaas. I have recently moved to the Gulf coast of Florida and have never done any inshore fishing. What is a very good all around inshore and fresh water spinning reel about the size of the Shimano 4000? 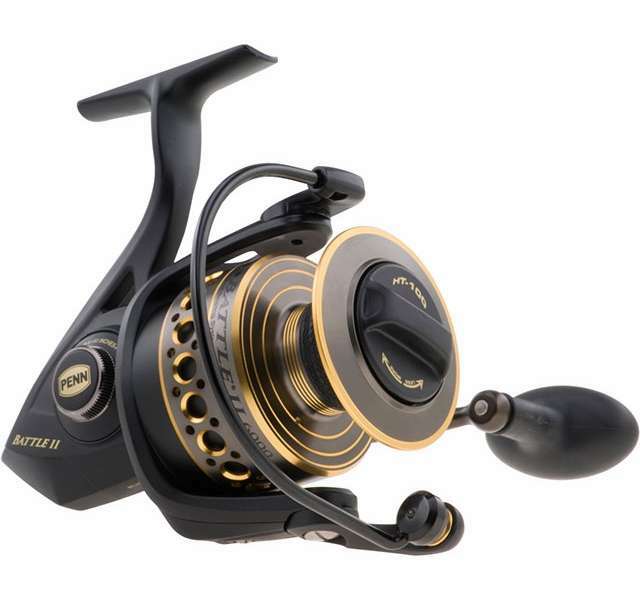 The Penn Battle II 4000 (PEN-1333) is a very good all around reel at a great price. Also consider the Quantum Cabo 40 (QUA-0297). It is lighter then the Penn and has a titanium magnetic bail system which is virtually indestructible. Hi TackleDirect, I am looking at the battle 2500 for seatrout, flounder, and redfish. What rod would you reccomend? I will be using 10 - 15 pound braid and 1/16 oz to 3/8 oz jigs. Im in louisiana and fish for reds and trout, fish with mostly 20lb braid, looking for a battle that will be fit for what I fish for.. The 3000 size would work really well for you. Plenty of line capacity and drag. The 2000 size would be perfect for your application. It will hold 180yards of 6# or 125 yards of 8#. It would be great on that G-Loomis. Hello Sharon! For the rod you are getting, the Penn Battle 2 reels would be a perfect choice! They are super durable yet very affordable and would pair nicely with your rod. Please feel free to contact us if you have any more questions! Hi..let me ask, where would you go fishing?Is it in in the sea? Or river maybe? A 10' rod may be a bit too long if you would ask me. For Battle 2, I would recommend something around 7-8'. Just one thing you have to consider is Power (Light, Medium or Heavy) and the Action (e.g. Fast). If you are looking to catch multiple types of fish, you may want to go for a Medium/Fast rating rod. It works perfectly for all of us here in Salalah, Oman. Unfortunately, we do not have that information. We suggest contacting Penn directly at 800-892-5444.
im a surf fisherman and im wondering if i should buy the 4000 or the 5000 to pair with an 8'6 century surf rod, i will put 20 or 30 pound braid on the reel. We suggest going with the 5000. It gives you greater line capacity as well as more drag. How much 10# and 15# braid can you fit on the 5000? These reels have not yet been released. It should hold around 500-550 yards of 10# and 15# braid.